Before this post I hadn't dyed my hair in a good 9 months (roughly) which for me is really good going as I'm always always switching around the shade of brunette/ brown that I want my hair to be at any given time. At some point I knew I should give my hair a break and decided that after cutting it all off, it was the perfect time to start fresh. Fast forward 9 months and my roots and natural hair colour (which I now know the colour of) had worn my patience thin. It was time to do something about it. 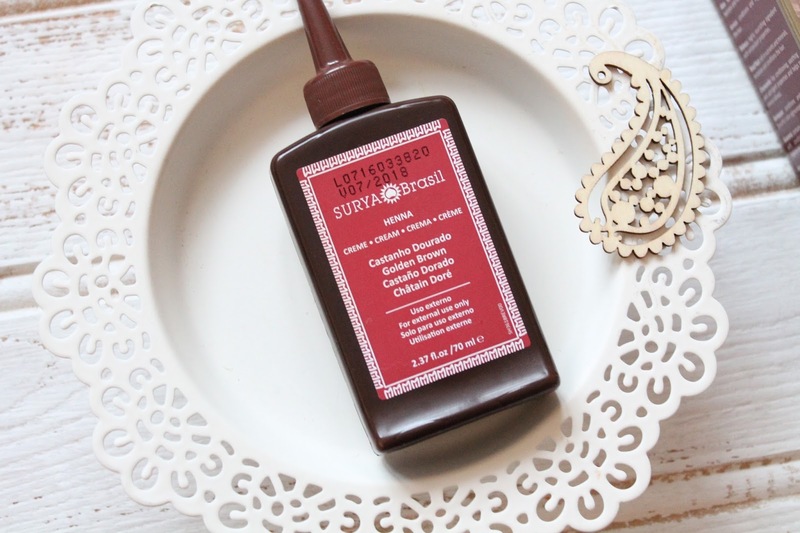 After some research and much toing and froing Surya Brasil Henna Cream in Golden Brown* arrived ready to tackle my barnet. I chose this product because I'm already a big fan of henna hair colouring but had never come across a henna cream before. Essentially it is just a premixed henna formula. Henna powders can be pretty messy and fiddly to prepare and I reckoned that this liquid 'cream' version would make things much much easier. Blissfully I was right. This was hands down the easiest hair dye I have ever done. It comes in one bottle. That's it. No tricky powders, no mixing bowls needed, no hot water at certain temperatures, no mess no fuss. With this Henna Cream you simply shake the bottle, pop on the gloves provided, cut the top off and apply. once you've applied it you pop on the little plastic cap provided and sit pretty for the required time (30-60 mins depending on your desired results). You couldn't get simpler or easier than that. Not only did this make the whole process a lot cleaner and less messy, it was also so much quicker too. Another major plus - it doesn't stink. Traditional henna often smells very strongly, and the scent sticks around for days- but with this one- not a bit! Th formula is a little more fluid than you would expect from the name 'cream' but this was great as it made it easy to dispense from the bottle and apply evenly. I have shoulder length hair, but it is super thick and this bottled would have covered it twice over I think. You can save the formula for another time if you need but I went wild and popped it all on. I have to admit at first I saw the size of the bottle and felt a little bit outraged at how small it seemed, but after a few minutes of applying I soon realised that you get a lot of product in that little bottle. I do have to say though that in my opinion the packaging is down right awful. That sounds really harsh but it is so unappealing. Had this product not been on LoveLula - a site I trust for providing the best of products and brands- I would never have purchased it. It doesn't look high quality it looks quite cheap, the artwork and colour scheme do nothing to sell the product at all. It looks old fashioned which is a shame as a Henna brand has so much potential for beautiful bold packaging and this is just lacking any appeal to me. However, thankfully the quality of the product itself makes up for the disastrous packaging, which just goes to show you shouldn't judge a book by it's cover, or a hardy by its box! I decided on the shade Golden Brown, this is a more red/golden toned dye than my actual hair colour and a bit lighter in shade. I chose this as I didn't want to change my hair colour completely, rather just even it out a little between the colour of my roots and my tips and add gloss and shine. I can happily say it did everything I hoped it would. It added a warmer tint to my hair, blended the difference between my roots and ends seemlessly and added a lovely glossy shine. I tried to photo it but because I chose such a subtle shade it just wasn't picking up on camera. It's lasted me several washes without any dramatic fade so far and hopefully will last the 7-10 washes they claim it will stay for. I've already got two other shades I'm 100% going to try out soon. 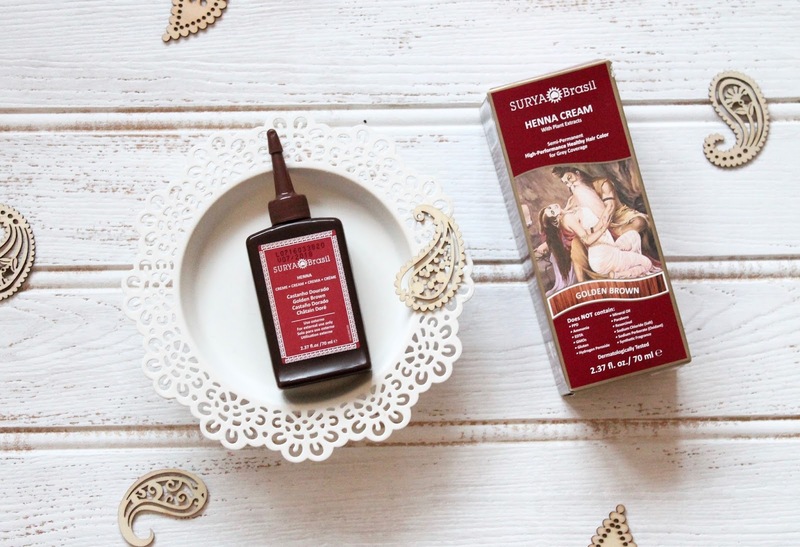 This Henna Cream is certified cruelty free, not tested on animals and certified vegan. It does not contain: PPD, Resorcinol, Ammonia, EDTA, Parabens, Mineral Oils, Synthetic Fragrances, Gluten, Sodium Perborate, GMOs or Hydrogen Peroxide.